This weekend turned out to be interesting. While cooking for a couple of guest blog entries for an upcoming iPhone app, I accidentally let my left ring finger get under the tip of my Wusthof knife and sliced right into the top of my finger. It was by far the worst cut I’d ever experienced while cooking and it bled a ton. Luckily, we determined that once the bleeding stopped, I should be okay with a band-aid and Neosporin and we avoided a trip to the ER. Today, it’s nicely sealed up and protected by a band-aid still. I think being a clean cut helped make it heal a lot faster. This is last Friday’s lunch, which contains leftover pieces of vegetable tempura that I made for dinner on Thursday. I’d made shrimp as well, but since my family is made up of shrimp fanatics, I happily ate only one and chowed down on the veggies. I still have more leftovers to eat, so you might see this pop up again later this week. By then I should have my review of the tempura batter I used up on Learn 2 Cook, which was a brand I hadn’t tried before. The bottom of the box is lined with plastic wrap to protect the box and also to create a place for me to drip sauce on top of the tempura while not getting it into the wood. I’m using my Mage-Wappa box from J-List. The rice went in first, then I simply laid the tempura on top, including: carrot tempura, eggplant, kabocha, and sweet potato. The kabocha is my favorite! I boiled the corn and edamame at the same time in my little pyrex, nuking it on high for about 2 1/2 minutes. Once that was done, the corn was easy to slice into half wedges. 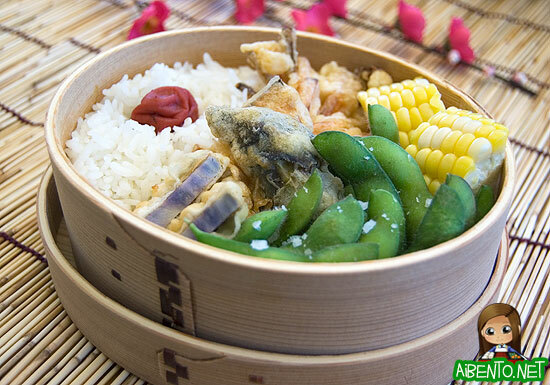 I sprinkled some sea salt onto the edamame and added an ume to the rice. I have no idea what this lunch ended up being points wise as I don’t know how to accurately gauge veggie tempura. 🙁 I’m guessing it’s insanely high because of the high starch content (rice, batter, corn, edamame). This week I lost no weight, mostly due to going to the movies and eating popcorn and snacks as a consolation prize for my Nearly Headless Finger. And the flaky donuts Grandma J brought on Saturday. Boy did I want to throw a cupcake at her. I used plain white cake, but added 3 drops of hot pink coloring. I made the frosting myself, but added the milk too early and didn’t have time to warm the butter enough, so although it tasted yummy, the frosting looked grainy. It was also runny, which is why I only had a splattering in the middle instead of covering the whole thing. It’s just as well, the frosting was insanely sweet. 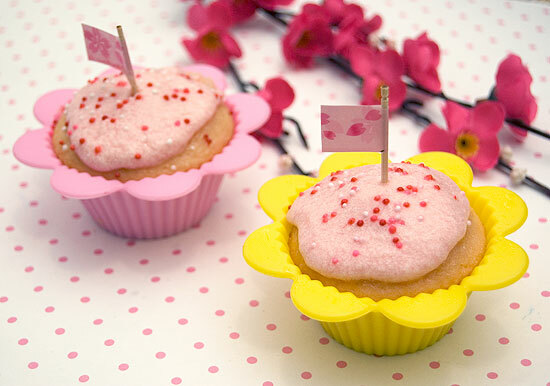 I added sprinkles and then little toothpick flags with sakura tape. I used Wilton Flower Silicone Fun Cups , which I’d bought at a store a while ago and forgotten. Baby Girl pointed out that I’d made “Daisy Cupcakes for Daisy Girl Scouts”, so for being clever I let her eat two. I’m proud to say I didn’t throw either at her. The cups were really cool! This was my first time using silicone cups and I sprayed a paper towel and wiped the inside of the cups to make them non-stick. The girls easily popped the cupcakes out whole and had their snack.